PARIS -- Anthony Bourdain, the TV celebrity and food writer who hosted CNN's "Parts Unknown," was found dead in his hotel room Friday. He was in France while working on his series on culinary traditions around the world. Bordain was 61. CNN confirmed the death, saying that Bourdain was found unresponsive Friday morning by friend and chef Eric Ripert near the French city of Strasbourg. It called his death a suicide. "Anthony was a dear friend," Ripert said in a statement to CBS News. "He was an exceptional human being, so inspiring and generous. One of the great storytellers of our time who connected with so many. I wish him peace. My love and prayers are with his family, friends and loved ones." Bourdain's girlfriend, actress Asia Argento, said in a statement posted to Twitter that she was "beyond devastated." "Anthony gave all of himself in everything that he did," Argento said. "His brilliant, fearless spirit touched and inspired so many, and his generosity knew no bounds. He was my love, my rock, my protector. I am beyond devastated." Bourdain achieved celebrity status after the publication in 2000 of his best-selling book "Kitchen Confidential: Adventures in the Culinary Underbelly." The book created a sensation by combining frank details of his life and career with behind-the-scenes observations on the culinary industry. It was a rare crossover -- a book intended for professional cooks that had enormous mass appeal. 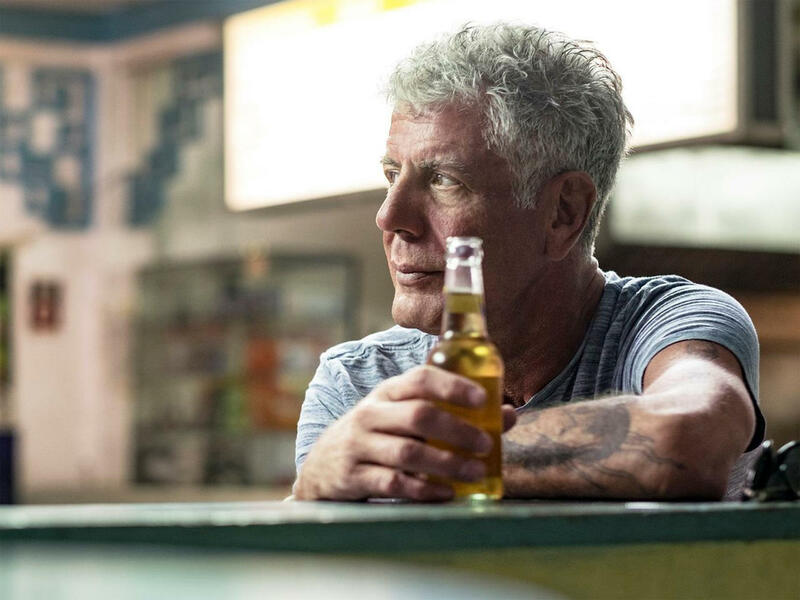 Bourdain went on to achieve widespread fame thanks to his CNN series "Parts Unknown" -- and was filming an upcoming segment for the program when he was found dead, according to CNN. He was staying at Le Chambard, a five-star hotel. "Tony was an exceptional talent. A storyteller. A gifted writer. A world traveler. An adventurer. He brought something to CNN that no one else had ever brought before," CNN chief executive Jeff Zucker said in a note to staff. "This is a very, very sad day." On Saturday, Christian de Rocquigny, the prosecutor of Colmar in France's Alsace region, said Bourdain killed himself in his hotel room. He told The Associated Press "there is no element that makes us suspect that someone came into the room at any moment." He also said a medical expert had concluded there were no signs of violence on Bourdain's body. The prosecutor said toxicology tests were being carried out to see if Bourdain took any medications. Bourdain's assistant Laurie Woolever would not comment Friday when reached by the AP. In his travels, Bourdain has eaten everything from rotten shark to sheep testicles. "Is there anything you won't eat?" CBS News' Anthony Mason asked Bourdain in 2016. "I've eaten a lot of bad food, I've eaten a lot of putrefied food," Bourdain said. "It's when no one cares at all, that's soul-destroying. I mean, maybe I take it too seriously, but I will literally -- a really carelessly made burger by a cynical, large company, the contempt implicit in that transaction can really send me into a spiral of depression that will last for days." Celebrity Chefs, fans and President Trump were among those stunned and saddened by the news. "I want to extend to his family my heartfelt condolences," Mr. Trump said. Jamie Oliver wrote on Instagram that Bourdain "really broke the mould ... he leaves chefs and fans around the world with a massive foodie hole that simply can't be replaced." Chef Yotam Ottolenghi tweeted "Shocking and sad!" while Nigella Lawson tweeted she was "Heartbroken." "Bourdain's exceptional writing made this one formerly picky, fearful eater very brave and want to try everything and I'll always be grateful for him and the worlds he opened," tweeted Lin-Manuel Miranda. Bourdain's death came three days after fashion designer Kate Spade killed herself in her Park Avenue apartment in New York. Spade's husband and business partner said the 55-year-old business mogul had suffered from depression and anxiety for many years. Bourdain's "Parts Unknown" seemed like an odd choice for CNN when it started in 2013 - part travelogue, part history lesson, part love letter to exotic foods. Each trip was an adventure. There had been nothing quite like it on the staid news network, and it became an immediate hit. He mixed a coarseness and whimsical sense of adventurousness, true to the rock 'n' roll music he loved. "We are constantly asking ourselves, first and foremost, what is the most (messed) up thing we can do next week?" he said in a 2014 interview with the AP. Besides showcasing food, a "Parts Unknown" trip to Japan in the series' first season included an odd show with robots and scantily clad women, a visit with a death metal band and a meal shared with a woman involved in the city's sadomasochistic community. In 2016, he sat down for some bun cha in Hanoi, Vietnam, with President Obama. "If you think about who the audience is and what their expectations might be, I think that's the road to badness and mediocrity," he told the AP. "You go out there and show the best story you can as best you can. If it's interesting to you, hopefully it's interesting to others. If you don't make television like that, it's pandering." In the preface to the latest edition "Kitchen Confidential," Bourdain wrote of his shock at the success of his book, which he wrote by getting up at 5 a.m. to steal a couple of hours at the computer before appearing at the saute station for lunch. He said he never intended to write an expose or to "rip the lid off the restaurant business." He said he liked the restaurant business the way it was. "What I set out to do was write a book that my fellow cooks would find entertaining and true," he said. "I wanted it to sound like me talking at say ... ten o'clock on a Saturday night, after a busy dinner rush, me and a few cooks hanging around in the kitchen, knocking back a few beers and talking." "The new celebrity chef culture is a remarkable and admittedly annoying phenomenon. While it's been nothing but good for business - and for me personally - many of us in the life can't help snickering about it," he wrote. "Of all the professions, after all, few people are less suited to be suddenly thrown into the public eye than chefs." Bourdain's introduction to "Kitchen Confidential: Insider's Edition" was scrawled in his own hand in block letters - offering the sense of making it personal right away.